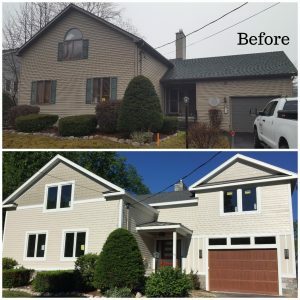 All of the final details of this remodel and additional made this home bright and inviting! 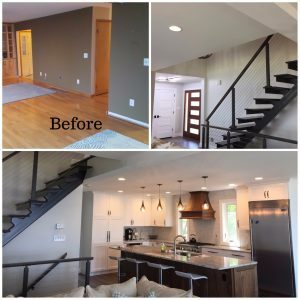 Opening up the walls in the living room, kitchen and stairway make all the difference! Stay on the lookout for professional photos of this project in the fall! 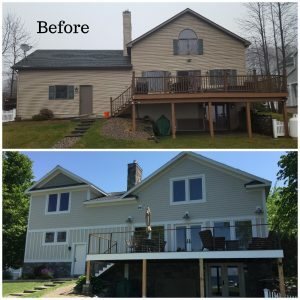 Throughout the exterior you will find new fibercement siding, Marvin windows & doors, new garage door, new masonry work, trex decking and cable railings. The stairway was removed and relocated for a cable rail system. Kitchen was gutted and walls opened up to bring in more natural daylight throughout the living room and entryway. 2018 Showcase People’s Choice Award! Proud to be an award-winning builder! 2018 Showcase of Homes – We are participating!